Three days before choreographer Camille A. Brown presents her electrifying dance-theater work Mr. TOL E. RAncE at the Lincoln Center Out of Doors Festival in New York City, she and seven members of her company, plus composer-pianist Scott Patterson, gather around a laptop computer in a studio at the City Center before a rehearsal. Amid hearty laughter, they study a video of a previous performance, looking for places where they could improve. They are intent on getting everything right. The 34-year-old Brown—a former member of Ronald K. Brown’s Evidence, a Dance Company and Rennie Harris Puremovement—started her troupe, Camille A. Brown & Dancers, in 2010 and has been challenging audiences ever since with humanistic works that often examine controversial aspects of our society. Inspired by Mel Watkins’ book On the Real Side: A History of African American Comedy From Slavery to Chris Rock, Spike Lee’s film Bamboozled and Dave Chappelle’s “dancing vs. shuffling” analogy, Brown takes on racial stereotypes and celebrates African-American humor in this new piece, citing TV shows Amos ’n’ Andy, Diff’rent Strokes and The Jeffersons and some of today’s entertainers. Employing movement derived from contemporary dance, hip-hop, African dance, ballet and tap, she evokes a wide range of emotion, from anger and sadness to genuine joy. Brown also knows how to move people physically as she joins her dancers for the rehearsal, moving the piano to the center of the studio, where Patterson will play his rambunctious and nuanced score for the duration of the piece. 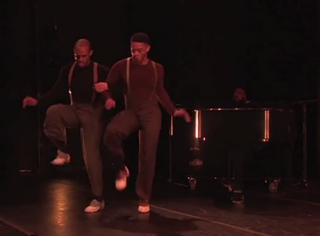 His first work for dance, it evokes everything from the 1940s big band era to ’80s hip-hop. He sounds a note and the dancers all start to move, a few wildly, others in a more constricted manner, artificial smiles straining their faces. They convey desperation and pleasure, the twin emotions that so often pervaded minstrelsy. To perform her dances takes not only enormous physical facility but also guts. Just the gamut of emotions in Mr. TOL E. RAncE and the sensitivity of the subject manner demand a flexible and confident dancer. As it turns out, they are an especially warm and friendly group, who seem unfazed by the demands placed upon them. After the rehearsal, Brown and the dancers gathered around actor Delroy Lindo, who had become enthusiastic about her work after seeing it at 651 Arts, the Brooklyn, N.Y.-based organization dedicated to performing arts of the African Diaspora, where he is a board member. He had volunteered to give Brown notes and share some of his knowledge of performance with the group. Shaking his hand and saying goodbye, the dancers stream out into the night, while Brown readies herself for the next day, admitting that she never would have thought she could pull off such a controversial major work. Valerie Gladstone writes about the arts for the New York Times, Washington Post, Los Angeles Times and many other publications. She is the co-author, with photographer Jose Ivey, of the children’s book A Young Dancer: The Life of an Ailey Student.